Amino acids are the building blocks of polypeptides and proteins, which are used as structural components and enzymes. If you’re taking biochemistry, organic chemistry, or genetics, you need to be familiar with the 20 amino acids and also know their side chains. It’s the nature of the side chains that determines how a protein folds into its structure and how it functions. Non-Polar Hydrophobic: The non-polar hydrophobic amino acids lack side chain polarity. They tend not to interact with water molecules. These amino acids are glycine, alanine, valine, leucine, isoleucine, methionine, phenylalanine, tryptophan, and proline. Polar Hydrophobic: Even though these amino acids are polar, they only weakly interact with water. Polar hydrophobic amino acids are either weakly hydrophobic or else the configuration of the side chain prohibits interaction with water. These amino acids are cysteine and tyrosine. Polar Hydrophilic: These amino acids are water-loving because of electronegativity differences between atoms in the side chains (e.g., N and O). Their presence causes a polypeptide chain to twist toward water, while a hydrophobic chain causes a twist away from water. The polar hydrophilic amino acids are serine, threonine, asparagine, and glutamine. Acidic: If there is a carboxylic acid in a side chain, you get an acidic side chain. If the NH2 group is swapped for an OH group, you can an acidic carboxyl group. Amino acids with acidic side groups are aspartic acid/aspartate, acetic acid/acetate, and glutamic acid/glutamate. Basic: If it’s an amino “acid,” then how can it be basic? Basic amino acids have a nitrogen atom that has a lone electron pair that can react with a hydrogen atom. At a low pH (acidic conditions), the amino acid may attach to a free proton to form a conjugate acid salt. Identify a basic amino acid by the presence of a positive-charged nitrogen in its side chain. The basic amino acids are lysine, arginine, and histidine. Memorizing the 20 common amino acids can be a tedious chore since the structures share so many common parts. Each amino acid has an amine group (where it gets its name) at one end and a carboxylic acid group at the other end. The differences between them can be found between these two ends attached to the central carbon in the region known as the side chain. 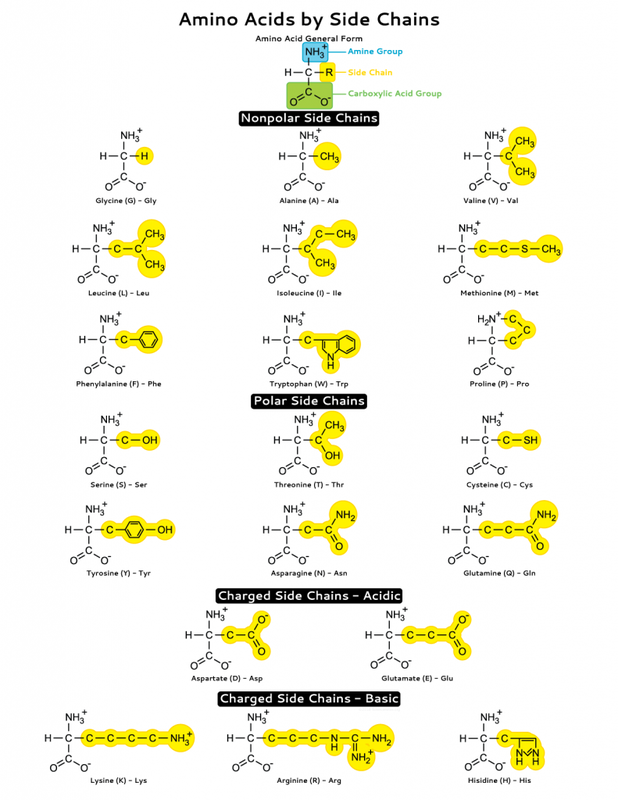 This amino acids study sheet groups the 20 common amino acids by their side chain properties. This includes polar, non-polar, and charged side chains. The charged side chains are further grouped by their tendency to act as an acid or a base. This study sheet is available as an image or PDF for printing. The PDF is optimized for an 8½” × 11″ sheet of paper but scales nicely to A4 when using the scale to fit settings in your PDF printing settings. This study sheet contains just the structures of the 20 common amino acids.